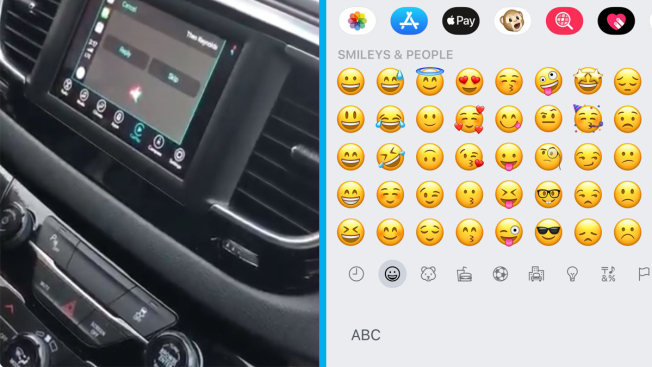 "Theo Reynolds said, '35 emojis: a grinning face, a sunglasses face, a crazy face...'"
A man’s tweet has gone viral after he shared a video of his car’s GPS reading out a text from his 14-year-old son. Aaron Reynolds, from Toronto, shared the video of Apple’s CarPlay reading the text, which he received while his wife was driving. The text, a cryptic emoji-laden message, was sent by the Reynolds’ eldest son, Theo. Emojis are small digital icons such as, tiny smiley faces, hand gestures, cartoon vehicles and food. They have taken center stage in modern day communication as an easy, fun way to express ideas, emotions and objects! The video, which captured the hilarious integration of technology within technology, was shared on Twitter where it garnered attention from thousands. Fellow parents appreciated the video and empathized with its relatability. Others commended Theo’s witty use of technology to mess with his parents.